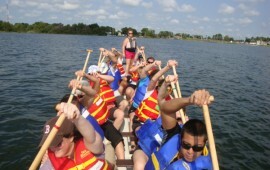 Dragon boating and the reality of corporate life today have a strong connection. They are both fast paced; they have to deal with changing external environments; and most of all, they both rely heavily on the ‘ultimate team’ in order to succeed. We already have several corporate and community teams that practice with us, and there are many benefits to forming a team. One of the primary benefits of dragon boating is team-building, as success is determined by 20 paddlers all working together in synchronicity. Do you have a health and wellness plan for your office? Dragon boating is also great exercise, and many corporate teams use it to promote health and wellness, as well as team-building. Quite simply, the DBC is here to help you preprare, so that you you can enjoy a day of racing and relaxing when the festival rolls around. For further information about boat leasing and scheduling, please contact Joe at odbcinfo@yahoo.com.